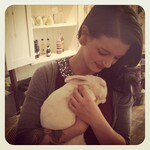 Coriander Girl: New addition to the Coriander fam! New addition to the Coriander fam! If my little flower shop could dance, she would throw on a mix of 90's party jams and get a little crazy. Why party jams? What's new at Coriander Girl you ask? 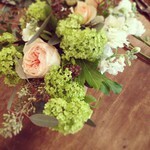 We recently welcomed 'The Little Florist' Tellie Hunt. Yeah... she's takin' names. Rogers Business Internet you better be run, cuz this girl doesn't just settle for highspeed. In all seriousness, I feel so blessed to have her. Her floral skills are amazing and her organizational skills could put Martha to shame. I'm not always the most organized human on the planet, but thanks to Tellie, everything has a place and there is a label on it. Please come in and introduce yourselves to this lovely, lovely lady. 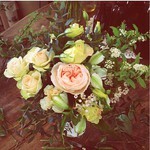 Tellie 's recent bouquets and a snuggle with Harry. Its always good to get a helping hand....hope you have loads of happy times!! I am so, so happy for you! She seems like the perfect fit!